Community members of northern Manhattan occupied a city council member’s office to demand affordable housing. 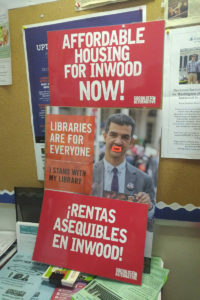 On Thursday, August 2, eleven community members of the working-class neighborhood of Inwood in the northern reaches of Manhattan occupied city council member Ydanis Rodriguez’s office. The protest demanded Rodriguez rescind his support for a plan to rezone the neighborhood in favor of developers. The action was organized by Northern Manhattan Is Not For Sale, with whom members of Socialist Alternative are working in coalition alongside residents, the Met Council On Housing, and others. Earlier that day the subcommittee on rezonings and land use voted in favor of a Rodriguez-approved final version of the rezoning plan for Inwood (that did not incorporate the community’s feedback) e, setting up a final vote by the full council on August 8. Inwood would become the fifth neighborhood to be rezoned by Mayor de Blasio’s administration. Based on previous experiences with rezoning of working class neighborhoods, residents can expect rising rents, more luxury condos, rising evictions, and displacement. For this reason, eleven people entered the office with a plan to stay there until either Rodriguez agreed to vote no or until they were arrested. Rodriguez had already experienced a rise in anger from his constituents earlier in the week when the same campaign organized a block party in Inwood on July 28 with hundreds of people in attendance. Rodriguez was invited to speak, but activists repeatedly interrupted him demanding that he vote no and make it absolutely clear he would support at least 50 percent affordable housing for families making around $34,000 or less. Rodriguez refused to commit and has claimed that he has the community on his side. Undoubtedly, the council member has plenty of reserves of support having himself led protests in the past. But unfortunately, his suggestion that it was only gentrifiers that oppose the rezone plan is not only false, it completely disregards the fact that the real gentrifiers are exactly the ones who are behind the rezoning plan – developers, Wall Street, and city officials. When the eleven people who occupied his office refused to leave on Thursday, Rodriguez first tried to ignore them. When it was clear they weren’t going anywhere – and in fact were ready to spend the night celebrating their action with salsa dancing, chanting and drumming – he reluctantly agreed to meet. He showed up around 9 pm waving a Dominican Republic flag, cynically playing to an important section of his base. Inside, he rudely dismissed the concerns of his constituents, including Dominican women. Without agreeing to anything, he left and for a few moments it got very tense when staff locked the doors, cut the lights, and set off the alarm. Police threatened to arrest people until Rodriguez’s staff intervened hoping to avoid embarrassing arrests. In the end, the eleven occupiers were allowed to stay. The next morning, rallies began outside at 9 am, but a few occupiers needed to head off to work hoping to return afterward or be replaced by reinforcements. By mid-day it was clear that Rodriguez and police were not going to allow things to continue. But they were not yet prepared for who they were dealing with. They managed to pick off a few people and get them out of the office. But occupier, senior resident, and Dominican immigrant Maria Peña completely defied and outmaneuvered them. She locked herself in the bathroom, which had a barred window facing the street from which she could talk to supporters and the media while taunting the police and Rodriguez. For hours she heroically refused to leave. But eventually she had no choice. After emerging, however, from a difficult situation and a sleepless night, Maria Peña was among the first to continue leading chants and dances at that afternoon’s #OccupyRezoning Dance Party that went on long into the night on Saturday in front of Rodriguez’s offices. Another brave occupier and Community Board 12 member (CB12 earlier in the process gave an advisory vote against the rezoning), Ayisha Oglivie, was arrested on suspicious grounds for attempting to re-enter the office after Rodriguez had promised that the known protesters could come and go as they pleased. Although the occupation ended after 24 hours, the occupiers felt vindicated and the support they generated from the bold action gave their resistance new momentum. A citywide call to allies and residents for an emergency march to defend Inwood was placed soon thereafter and will happen later today. Other non-violent direct actions are planned in the few remaining days leading up to Wednesday’s vote. The community has made their position against the rezoning clear and are fighting it to the end with the broadest possible movement. 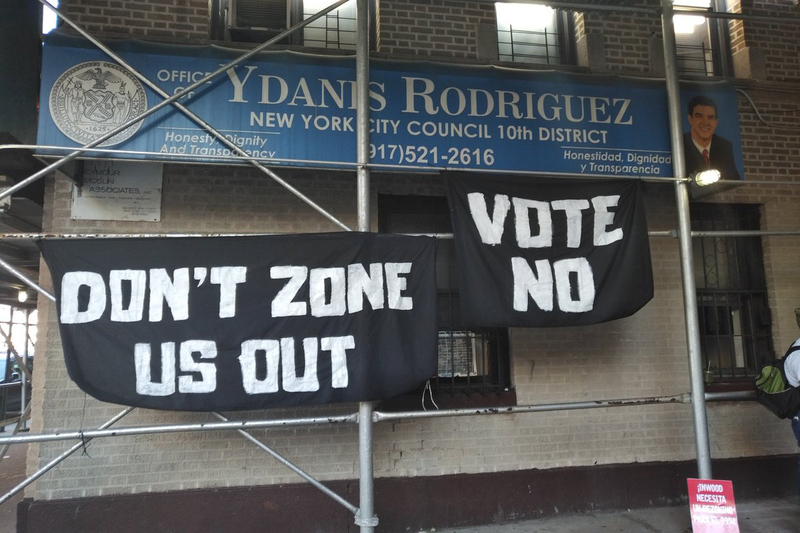 Unfortunately Rodriguez has also made his position in favor of predatory developers and landlords clear and the community must be prepared to continue the struggle beyond Wednesday’s city council vote. Socialist Alternative will continue organizing with the community for affordable housing and dignified city planning for the 99%.